We all have a role to play in preventing suicides. Suicide is a complex problem. But through our collective action, we can save lives. 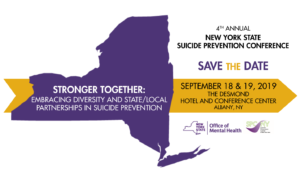 New York State is committed to preventing suicides. This site was designed to provide a comprehensive set of tools, information, and resources to support the effort. Having thoughts of suicide, or knowing someone who does, can be frightening. Learn where to find help for yourself, how to help family and friends during a suicidal crisis, and what resources are available after a suicide loss. Suicide prevention cannot succeed without community involvement and leadership. Learn what communities can do to reduce risk. Young adulthood can be a time of significant change and challenges. Learn what you as an administrator, educator, parent, or student can do to reduce risk and prevent suicide. Suicide deaths for individuals under the care of health and behavioral health systems are preventable. Find the tools and resources you need to prepare the workforce and prevent suicide within your healthcare system. We are now accepting proposals for oral and poster presentations. The submission deadline is May 3. Please view our conference page for more information and to submit your work! There are a variety of suicide prevention training options to choose from, whether you are a clinician, a non-clinical health care worker, a school or university administrator, educator, or community member. Suicide prevention trainings are provided across New York State. Sign up for a training near you! SPCNY supports and maintains a network of trainers. Contact us at spcny@omh.ny.gov if you are interested in becoming a trainer!